We humans have the ability to learn and solve our problems accordingly. We are self-aware and we’re also conscious of the presence, thoughts and feelings of others. We have language and we use it to express complex ideas. All of these are arguably signs of Intelligence. But are we alone showing these signs of intelligence? Animals are best known to us for being anything. From being Unconventionally Intelligent to downright Destructive in search of Food and Water, we have seen it all. From talking Parrots to future telling Octopus to Mice chewing up everything in site, the quest for survival continues. While wild animals generally leave humans out of their endeavors, one thirsty crow was smart enough to beg for and receive human help to get a drink. 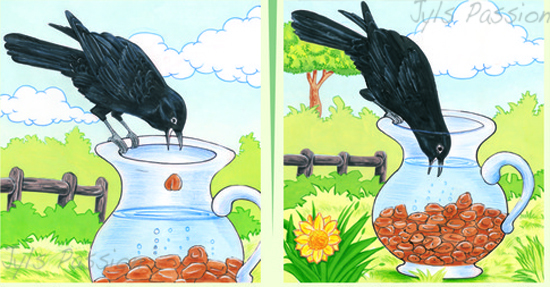 Now we all have read or heard about the story of a crow using pebbles to get water out of the pot. What will we possibly think of that crow? The crow will be smart, patient, hard-working blah blah. But not as smart as compared to this little guy who thought searching for water is too mainstream, so how about getting a little help from the neighbor. This crow was smart enough to receive human help to get a drink. At first the people there thought that the bird is begging for some food, so they tossed several crumbs to his way. But the smart bird ignored this feast, concentrating his energies on the cap of a bottle full of water. The bird continued to peck at the cap until one scared little boy managed to give the crow what he wanted. He removed the cap of the bottle to fill it with water. Once the cap is successfully filled, a man held it while the bird drank his fill. So, we had it all. A helping human being, a smart bird and a happy ending, what else does a perfect story need? Maybe Alfred Hitchcock was right. Maybe we should fear an uprising of birds.